Simply SAAB: Independent SAAB Specialist in Pittsburgh, PA.: T7 Crankcase updates... 9-3's and 9-5's, listen up! T7 Crankcase updates... 9-3's and 9-5's, listen up! Now that the big 3 have been wrapped up, I'm going to move onto some general maintenance related things. Now, there are many things I could start with here... fuel filters, spark plugs, radiator hoses, whatever. To me, however, there is something much more important. This does not apply to everyone, just T7 cars (00-03CV 9-3's and 1999-2006 9-5's). To the applicable, let me tell you a story. Somewhere, in 1997 Sweden, engineers sat around, pencils behind ears and coffee pots overflowing, and designed the 9-3 and 9-5 to follow the NG900 and the 9000. They tested the cars beyond comprehension, putting them on earthquake-like suspension testers, driving them into barrels that simulated Moose's, and doing countless laps on the race tracks of Europe. Not a detail was missed! ":P.s cough:"....and the fuel pump access hole in the 9-3. That too. ":P.s. cough:"
Anyway, what I'm getting at here, is that these engines flowed crankcase gasses about as well as ice flows downstream... it just doesn't. It stays and builds up, and eventually, bad things happen. That's kind of the story with the T-7 engine. At idle, none of the gasses generated by the crankcase system get ventilated and what results, amongst other things, is SLUDGE. Say it with me now... SLUDGE. Saab realized this was a problem about the same time the attorneys for all the people effected were sending out their affidavits to the judge, attempting to get money from Saab for engine replacements paid for out of pocket. 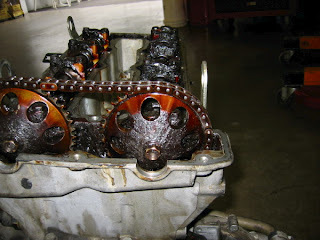 Sludge kills engines, but usually will kill a turbo first. 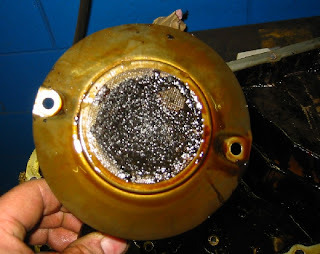 What happens is the oil feed line that supply's the precious lubrication to the turbo cakes up with sludge and flow gets cut off to the turbo (think Macdonald's lover needing a triple bypass). Without lubrication, the turbo overheats and cooks the bearings, seals, and eventually will shred the compressor wheel from all the play in the shaft. Did I mention I rebuild turbos? The reason I got into doing this was how many I was seeing from cooked and sludged engines that it was lucrative enough for me to start doing in house. Anyway, more on that later. I borrowed these photos from Anders (the Saab expert, if you ask me), they are from his TSN gallery. They show a severe sludge problem in the T7 engine. 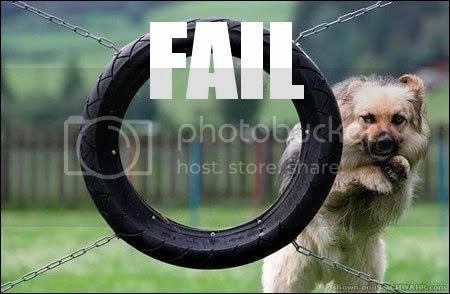 The moral here is that sludge is real, and must be addressed. Change your oil, and change it often, always using Mobil 1 synthetic (you do use synthetic, right?) 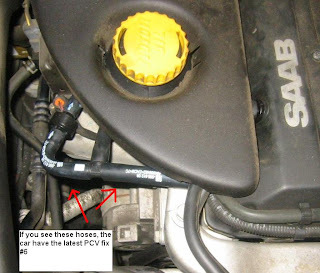 and Genuine Saab or Mann filters. 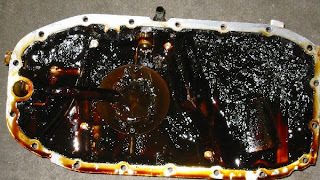 Taking 20 minutes to pull your valve cover and do a sludge inspection can save your car, and will also put your mind at ease when you find a clean and lovely honeypot of oil under there. Oh yeah, I forgot. If you're replacing a blown turbo due to sludge or oil cooking, ALWAYS replace the oil feed pipe too. Install the new one with the old pipe and you might as well leave all the bolts decently loose, because you will be turning them again next week. Write that down. Chuck Andrews, owner of Andrews of Princeton, does some great writing for NINES magazine and has many of his informative articles posted in PDF format on his website for you to read, you can check them out here. Check out Anders Gallery at TSN for interesting and eye opening Saab photos.